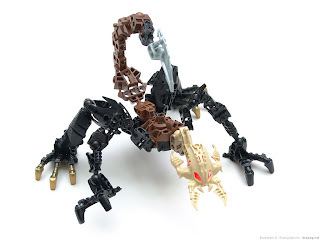 At last, I have been in contact with Milethi once more. The price was exhorbitant, but the information she has presented has priceless, though intangible value. 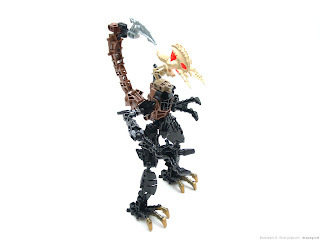 Milethi, a highly skilled scientist in the highly controversial field of Bionicle evolution, first determined the anatomical design of the ancestors of the Vorox, based on evidence in the recent fossil record. She then did the same for the Zesk, with peculiarly identical results. I was, unamused, to say the least. Aside from some slightly altered proportions and colors -- colors, how useless -- this might as well have been an image of a modern-day Vorox! I had delivered the heads of eight nearly-extinct giant, predatory insects for Milethi's bizarre alchemic experiments, and this was my reward?? Hrmm. It is time, I see. I must... visit an old friend. He is holding onto some... pictures... for me. Very valuable pictures. Pictures, that the Great Beings would very much like to see destroyed, forever.